This fresco painted on the wall of a tomb has been through at least one relocation, a fire and has been divided in half and painted over. Nonetheless this painting remains a cornerstone achievement in western painting. The Trinity is a very unique painting in a few different ways. Firstly, the vaulting done over the head of Christ who is held up by God was the first successful image to create the depth and the three dimensional image. The outlining of the crucifixion or frame within the painting is classical shown by the columns on either sides. Other than the pleasing aesthetic, Trinity and its use of linear perspective work to enhance the theme. The vanishing-point coerces the viewer to begin looking at the top of the first stair with the vault and the trinity, Christ, God and a dove, looming over from above. This is a breakdown of the use of linear perspective and vanishing-point. You can see that the painting is designed to incorporate the viewer. From the viewer's vantage point the viewer can experience depth inside the painting. A proper diagnosis of the painting cannot be done without some idea of linear perspective. Linear perspective is a mathematical system for creating three dimensional shapes and figure on a flat surface. The writer Leon Battista Alberti, wrote down what is considered now to be the guide to linear perspective. To achieve linear perspective, adding depth and a three dimension to the painting, one must draw a horizon line to connect the viewer's eye to a point in the "distance," like where the sky meets the ground. Horizontal lines called orthogonal lines are then drawn over the canvas or work space. The point where orthogonal lines meet is called the vanishing point. One can think of train tracks in the distance. The Trinity with the columns on both sides and the vault fading directly back into the distance is spatially correct. What is not found here is Masaccio's use of light colors and a unique softness applied to his characters that we see in his frescoes at the Brancacci Chapel, especially in the painting Tribute Money. Although considered the creator of linear perspective in the painting, it is debated whether he developed and implemented the technique correctly. The distance point is not exact as it seems to vary between 210.5 cm to 894.2 cm which is a drastic variation for any follower of linear perspective. It has been proposed instead of using linear perspective, Masaccio used costruzione legittima. A technique that offers some maneuvering of a three-dimensional space buts lacks completes depth. The largest problem is seen with the coffers on the barrel vaulting above Christ and God. It has been argued that Masaccio did not derive his distance point from the flooring of the painting but rather from up above from the vaulting. In Euclid's Elements, a book on geometry, the only correct way of mapping the coffers would be to divide the sections of the semicircle and into fourths or eighths and find the meeting point between all the divisions but Masaccio did not do that. 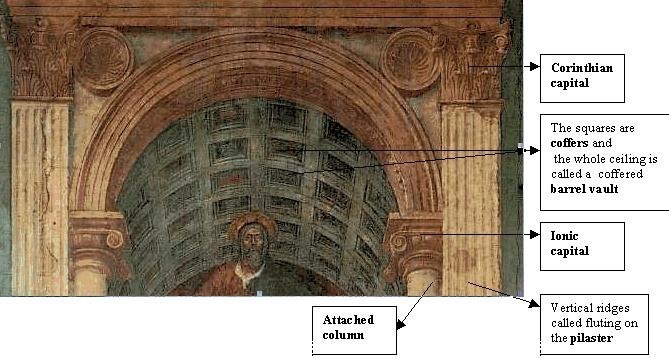 It seems that Masaccio instead used the horizontal plane that joins the abaci and the capitals to draw the vanishing lines for the vault. He did not follow the basic rules of geometry and so the search for his distance-point will be forever changing depending on what reference is used to examine the vault and the horizontal lines of the flooring below. Although there stills remains some debate over the mathematical exactness of the painting, owing to multiple restorations, and one relocation, much of the painting is thought to have been changed. In this model one can see the vanishing-point centered and exactly one third from the bottom of the painting. The distance-point comes from the right outside of the painting and allows Masaccio to add another plane and depth to the vault. Vasari wrote about the Trinity and its use of perspective "a barrel vault represented in perspective, and divided into squares full of bosses, which diminish and are foreshortened so well that the wall seems to be hollowed out." Vasari, was certainly correct. The depth given to the barrel vault is simply revolutionary. Masaccio placed the vanishing-point at the top of the raised step behind the donors creating the three dimensional hall behind the Trinity. •	Column - a round, supporting element in architecture. In this painting we see an attached column. •	Corinthian capital has leaf shapes. •	Flutung - the vertical indented lines or grooves that decorated the pilasters in the painting. Fluting could also be used on a column. 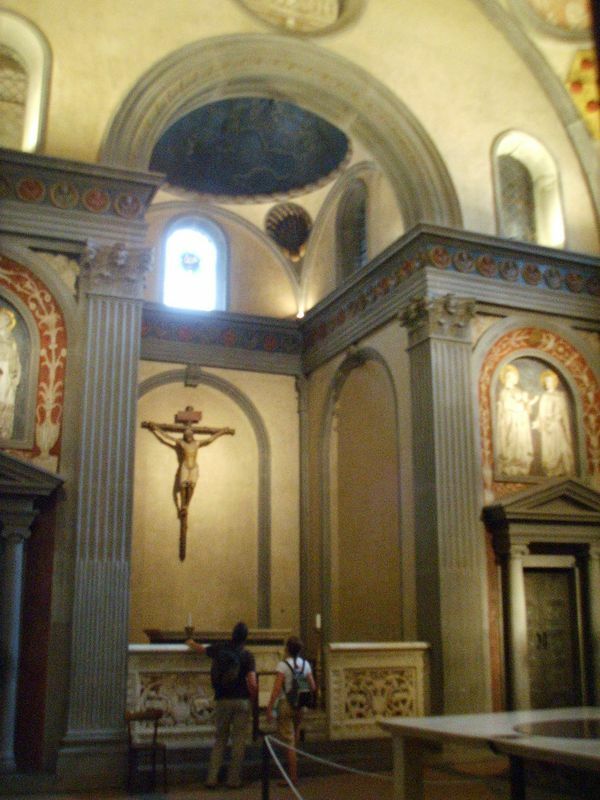 It is thought that sculptor Brunelleschi might have lent a hand in outlining the vault because of the similarity it has with his dome in the Old Sacristy but no record has been found to suggest their collaboration.